create-folders bool r/w Whether a file chooser not in open mode will offer the user to create new folders. do-overwrite-confirmation bool r/w Whether a file chooser in save mode will present an overwrite confirmation dialog if necessary. extra-widget Gtk.Widget r/w Application supplied widget for extra options. preview-widget Gtk.Widget r/w Application supplied widget for custom previews. preview-widget-active bool r/w Whether the application supplied widget for custom previews should be shown. use-preview-label bool r/w Whether to display a stock label with the name of the previewed file. confirm-overwrite This signal gets emitted whenever it is appropriate to present a confirmation dialog when the user has selected a file name that already exists. current-folder-changed This signal is emitted when the current folder in a Gtk.FileChooser changes. file-activated This signal is emitted when the user “activates” a file in the file chooser. selection-changed This signal is emitted when there is a change in the set of selected files in a Gtk.FileChooser. update-preview This signal is emitted when the preview in a file chooser should be regenerated. 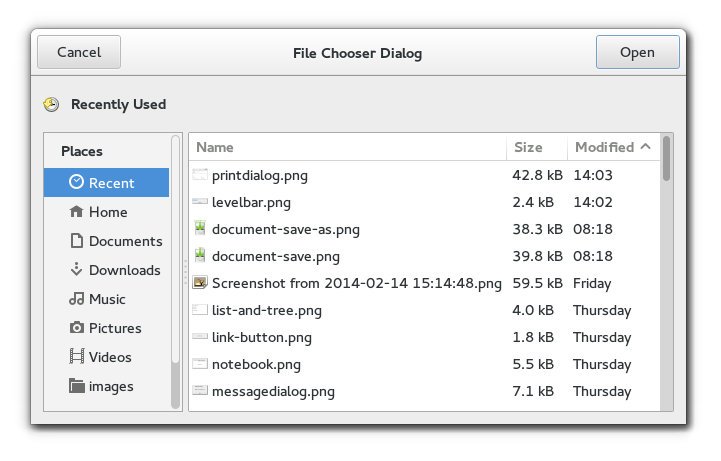 Gtk.FileChooser is an interface that can be implemented by file selection widgets. In GTK+, the main objects that implement this interface are Gtk.FileChooserWidget, Gtk.FileChooserDialog, and Gtk.FileChooserButton. You do not need to write an object that implements the Gtk.FileChooser interface unless you are trying to adapt an existing file selector to expose a standard programming interface. Bookmarks: are created by the user, by dragging folders from the right pane to the left pane, or by using the “Add”. Bookmarks can be renamed and deleted by the user. Shortcuts: can be provided by the application. For example, a Paint program may want to add a shortcut for a Clipart folder. Shortcuts cannot be modified by the user. Volumes: are provided by the underlying filesystem abstraction. They are the “roots” of the filesystem. When the user is finished selecting files in a Gtk.FileChooser, your program can get the selected names either as filenames or as URIs. For URIs, the normal escaping rules are applied if the URI contains non-ASCII characters. However, filenames are always returned in the character set specified by the G_FILENAME_ENCODING environment variable. Please see the GLib documentation for more details about this variable. This means that while you can pass the result of Gtk.FileChooser.get_filename() to open() or fopen(), you may not be able to directly set it as the text of a Gtk.Label widget unless you convert it first to UTF-8, which all GTK+ widgets expect. You should use GLib.filename_to_utf8() to convert filenames into strings that can be passed to GTK+ widgets. You can add a custom preview widget to a file chooser and then get notification about when the preview needs to be updated. To install a preview widget, use Gtk.FileChooser.set_preview_widget(). Then, connect to the Gtk.FileChooser ::update-preview signal to get notified when you need to update the contents of the preview. Your callback should use Gtk.FileChooser.get_preview_filename() to see what needs previewing. Once you have generated the preview for the corresponding file, you must call Gtk.FileChooser.set_preview_widget_active() with a boolean flag that indicates whether your callback could successfully generate a preview. You can add extra widgets to a file chooser to provide options that are not present in the default design. For example, you can add a toggle button to give the user the option to open a file in read-only mode. You can use Gtk.FileChooser.set_extra_widget() to insert additional widgets in a file chooser. If you want to set more than one extra widget in the file chooser, you can a container such as a Gtk.Box or a Gtk.Grid and include your widgets in it. Then, set the container as the whole extra widget. Adds a ‘choice’ to the file chooser. This is typically implemented as a combobox or, for boolean choices, as a checkbutton. You can select a value using Gtk.FileChooser.set_choice() before the dialog is shown, and you can obtain the user-selected value in the ::response signal handler using Gtk.FileChooser.get_choice(). Adds filter to the list of filters that the user can select between. When a filter is selected, only files that are passed by that filter are displayed. Note that the self takes ownership of the filter, so you have to ref and sink it if you want to keep a reference. True if the folder could be added successfully, False otherwise. In the latter case, the error will be set as appropriate. Adds a folder to be displayed with the shortcut folders in a file chooser. Note that shortcut folders do not get saved, as they are provided by the application. For example, you can use this to add a “/usr/share/mydrawprogram/Clipart” folder to the volume list. Adds a folder URI to be displayed with the shortcut folders in a file chooser. Note that shortcut folders do not get saved, as they are provided by the application. For example, you can use this to add a “file:///usr/share/mydrawprogram/Clipart” folder to the volume list. Gets the type of operation that the file chooser is performing; see Gtk.FileChooser.set_action(). Gets the currently selected option in the ‘choice’ with the given ID. True if the Create Folder button should be displayed. Gets whether file choser will offer to create new folders. See Gtk.FileChooser.set_create_folders(). the full path of the current folder, or None if the current path cannot be represented as a local filename. Free with GLib.free(). This function will also return None if the file chooser was unable to load the last folder that was requested from it; for example, as would be for calling Gtk.FileChooser.set_current_folder() on a nonexistent folder. Gets the current folder of self as a local filename. See Gtk.FileChooser.set_current_folder(). Note that this is the folder that the file chooser is currently displaying (e.g. “/home/username/Documents”), which is not the same as the currently-selected folder if the chooser is in Gtk.FileChooserAction.SELECT_FOLDER mode (e.g. “/home/username/Documents/selected-folder/”. To get the currently-selected folder in that mode, use Gtk.FileChooser.get_uri() as the usual way to get the selection. the Gio.File for the current folder. Gets the current folder of self as Gio.File. See Gtk.FileChooser.get_current_folder_uri(). the URI for the current folder. Free with GLib.free(). This function will also return None if the file chooser was unable to load the last folder that was requested from it; for example, as would be for calling Gtk.FileChooser.set_current_folder_uri() on a nonexistent folder. Gets the current folder of self as an URI. See Gtk.FileChooser.set_current_folder_uri(). Note that this is the folder that the file chooser is currently displaying (e.g. “file:///home/username/Documents”), which is not the same as the currently-selected folder if the chooser is in Gtk.FileChooserAction.SELECT_FOLDER mode (e.g. “file:///home/username/Documents/selected-folder/”. To get the currently-selected folder in that mode, use Gtk.FileChooser.get_uri() as the usual way to get the selection. The raw text from the file chooser’s “Name” entry. Free this with GLib.free(). Note that this string is not a full pathname or URI; it is whatever the contents of the entry are. Note also that this string is in UTF-8 encoding, which is not necessarily the system’s encoding for filenames. Gets the current name in the file selector, as entered by the user in the text entry for “Name”. This is meant to be used in save dialogs, to get the currently typed filename when the file itself does not exist yet. For example, an application that adds a custom extra widget to the file chooser for “file format” may want to change the extension of the typed filename based on the chosen format, say, from “.jpg” to “.png”. True if the file chooser will present a confirmation dialog; False otherwise. Queries whether a file chooser is set to confirm for overwriting when the user types a file name that already exists. Gets the current extra widget; see Gtk.FileChooser.set_extra_widget(). a selected Gio.File. You own the returned file; use GObject.Object.unref() to release it. Gets the Gio.File for the currently selected file in the file selector. If multiple files are selected, one of the files will be returned at random. If the file chooser is in folder mode, this function returns the selected folder. The currently selected filename, or None if no file is selected, or the selected file can’t be represented with a local filename. Free with GLib.free(). Gets the filename for the currently selected file in the file selector. The filename is returned as an absolute path. If multiple files are selected, one of the filenames will be returned at random. a GLib.SList containing the filenames of all selected files and subfolders in the current folder. Free the returned list with g_slist_free(), and the filenames with GLib.free(). a GLib.SList containing a Gio.File for each selected file and subfolder in the current folder. Free the returned list with g_slist_free(), and the files with GObject.Object.unref(). Lists all the selected files and subfolders in the current folder of self as Gio.File. An internal function, see Gtk.FileChooser.get_uris(). Gets the current filter; see Gtk.FileChooser.set_filter(). True if only local files can be selected. the Gio.File for the file to preview, or None if no file is selected. Free with GObject.Object.unref(). Gets the Gio.File that should be previewed in a custom preview Internal function, see Gtk.FileChooser.get_preview_uri(). Gets the filename that should be previewed in a custom preview widget. See Gtk.FileChooser.set_preview_widget(). the URI for the file to preview, or None if no file is selected. Free with GLib.free(). Gets the URI that should be previewed in a custom preview widget. See Gtk.FileChooser.set_preview_widget(). Gets the current preview widget; see Gtk.FileChooser.set_preview_widget(). True if the preview widget is active for the current filename. Gets whether the preview widget set by Gtk.FileChooser.set_preview_widget() should be shown for the current filename. See Gtk.FileChooser.set_preview_widget_active(). True if multiple files can be selected. Gets whether multiple files can be selected in the file selector. See Gtk.FileChooser.set_select_multiple(). True if hidden files and folders are displayed. Gets whether hidden files and folders are displayed in the file selector. See Gtk.FileChooser.set_show_hidden(). Gets the URI for the currently selected file in the file selector. If multiple files are selected, one of the filenames will be returned at random. a GLib.SList containing the URIs of all selected files and subfolders in the current folder. Free the returned list with g_slist_free(), and the filenames with GLib.free(). Lists all the selected files and subfolders in the current folder of self . The returned names are full absolute URIs. True if the file chooser is set to display a label with the name of the previewed file, False otherwise. Gets whether a stock label should be drawn with the name of the previewed file. See Gtk.FileChooser.set_use_preview_label(). a GLib.SList containing the current set of user selectable filters. The contents of the list are owned by GTK+, but you must free the list itself with g_slist_free() when you are done with it. Lists the current set of user-selectable filters; see Gtk.FileChooser.add_filter(), Gtk.FileChooser.remove_filter(). A list of folder URIs, or None if there are no shortcut folders. Free the returned list with g_slist_free(), and the URIs with GLib.free(). Queries the list of shortcut folders in the file chooser, as set by Gtk.FileChooser.add_shortcut_folder_uri(). A list of folder filenames, or None if there are no shortcut folders. Free the returned list with g_slist_free(), and the filenames with GLib.free(). Queries the list of shortcut folders in the file chooser, as set by Gtk.FileChooser.add_shortcut_folder(). Removes a ‘choice’ that has been added with Gtk.FileChooser.add_choice(). Removes filter from the list of filters that the user can select between. True if the operation succeeds, False otherwise. In the latter case, the error will be set as appropriate. Removes a folder from a file chooser’s list of shortcut folders. Removes a folder URI from a file chooser’s list of shortcut folders. Selects all the files in the current folder of a file chooser. Selects the file referred to by file . An internal function. See _gtk_file_chooser_select_uri(). Selects a filename. If the file name isn’t in the current folder of self , then the current folder of self will be changed to the folder containing filename . Selects the file to by uri . If the URI doesn’t refer to a file in the current folder of self , then the current folder of self will be changed to the folder containing filename . Sets the type of operation that the chooser is performing; the user interface is adapted to suit the selected action. For example, an option to create a new folder might be shown if the action is Gtk.FileChooserAction.SAVE but not if the action is Gtk.FileChooserAction.OPEN. Selects an option in a ‘choice’ that has been added with Gtk.FileChooser.add_choice(). For a boolean choice, the possible options are “true” and “false”. Sets whether file choser will offer to create new folders. This is only relevant if the action is not set to be Gtk.FileChooserAction.OPEN. Sets the current folder for self from a local filename. The user will be shown the full contents of the current folder, plus user interface elements for navigating to other folders. In general, you should not use this function. See the section on setting up a file chooser dialog for the rationale behind this. True if the folder could be changed successfully, False otherwise. Sets the current folder for self from a Gio.File. Internal function, see Gtk.FileChooser.set_current_folder_uri(). Sets the current folder for self from an URI. The user will be shown the full contents of the current folder, plus user interface elements for navigating to other folders. Sets the current name in the file selector, as if entered by the user. Note that the name passed in here is a UTF-8 string rather than a filename. This function is meant for such uses as a suggested name in a “Save As…” dialog. You can pass “Untitled.doc” or a similarly suitable suggestion for the name . If you want to preselect a particular existing file, you should use Gtk.FileChooser.set_filename() or Gtk.FileChooser.set_uri() instead. Please see the documentation for those functions for an example of using Gtk.FileChooser.set_current_name() as well. Sets whether a file chooser in Gtk.FileChooserAction.SAVE mode will present a confirmation dialog if the user types a file name that already exists. This is False by default. If set to True, the self will emit the Gtk.FileChooser ::confirm-overwrite signal when appropriate. If all you need is the stock confirmation dialog, set this property to True. You can override the way confirmation is done by actually handling the Gtk.FileChooser ::confirm-overwrite signal; please refer to its documentation for the details. Sets an application-supplied widget to provide extra options to the user. Sets file as the current filename for the file chooser, by changing to the file’s parent folder and actually selecting the file in list. If the self is in Gtk.FileChooserAction.SAVE mode, the file’s base name will also appear in the dialog’s file name entry. If the file name isn’t in the current folder of self , then the current folder of self will be changed to the folder containing filename . This is equivalent to a sequence of Gtk.FileChooser.unselect_all() followed by Gtk.FileChooser.select_filename(). Note that the file must exist, or nothing will be done except for the directory change. Sets filename as the current filename for the file chooser, by changing to the file’s parent folder and actually selecting the file in list; all other files will be unselected. If the self is in Gtk.FileChooserAction.SAVE mode, the file’s base name will also appear in the dialog’s file name entry. In the first case, the file chooser will present the user with useful suggestions as to where to save his new file. In the second case, the file’s existing location is already known, so the file chooser will use it. Sets the current filter; only the files that pass the filter will be displayed. If the user-selectable list of filters is non-empty, then the filter should be one of the filters in that list. Setting the current filter when the list of filters is empty is useful if you want to restrict the displayed set of files without letting the user change it. On some systems non-native files may still be available using the native filesystem via a userspace filesystem (FUSE). preview_widget (Gtk.Widget) – widget for displaying preview. Sets an application-supplied widget to use to display a custom preview of the currently selected file. To implement a preview, after setting the preview widget, you connect to the Gtk.FileChooser ::update-preview signal, and call Gtk.FileChooser.get_preview_filename() or Gtk.FileChooser.get_preview_uri() on each change. If you can display a preview of the new file, update your widget and set the preview active using Gtk.FileChooser.set_preview_widget_active(). Otherwise, set the preview inactive. When there is no application-supplied preview widget, or the application-supplied preview widget is not active, the file chooser will display no preview at all. Sets whether the preview widget set by Gtk.FileChooser.set_preview_widget() should be shown for the current filename. When active is set to false, the file chooser may display an internally generated preview of the current file or it may display no preview at all. See Gtk.FileChooser.set_preview_widget() for more details. select_multiple (bool) – True if multiple files can be selected. Sets whether multiple files can be selected in the file selector. This is only relevant if the action is set to be Gtk.FileChooserAction.OPEN or Gtk.FileChooserAction.SELECT_FOLDER. show_hidden (bool) – True if hidden files and folders should be displayed. Sets whether hidden files and folders are displayed in the file selector. Sets the file referred to by uri as the current file for the file chooser, by changing to the URI’s parent folder and actually selecting the URI in the list. If the self is Gtk.FileChooserAction.SAVE mode, the URI’s base name will also appear in the dialog’s file name entry. Note that the URI must exist, or nothing will be done except for the directory change. Sets whether the file chooser should display a stock label with the name of the file that is being previewed; the default is True. Applications that want to draw the whole preview area themselves should set this to False and display the name themselves in their preview widget. Unselects all the files in the current folder of a file chooser. Unselects the file referred to by file . If the file is not in the current directory, does not exist, or is otherwise not currently selected, does nothing. Unselects a currently selected filename. If the filename is not in the current directory, does not exist, or is otherwise not currently selected, does nothing. Unselects the file referred to by uri . If the file is not in the current directory, does not exist, or is otherwise not currently selected, does nothing. a Gtk.FileChooserConfirmation value that indicates which action to take after emitting the signal. This signal gets emitted whenever it is appropriate to present a confirmation dialog when the user has selected a file name that already exists. The signal only gets emitted when the file chooser is in Gtk.FileChooserAction.SAVE mode. Most applications just need to turn on the Gtk.FileChooser :do-overwrite-confirmation property (or call the Gtk.FileChooser.set_do_overwrite_confirmation() function), and they will automatically get a stock confirmation dialog. Applications which need to customize this behavior should do that, and also connect to the Gtk.FileChooser ::confirm-overwrite signal. A signal handler for this signal must return a Gtk.FileChooserConfirmation value, which indicates the action to take. If the handler determines that the user wants to select a different filename, it should return Gtk.FileChooserConfirmation.SELECT_AGAIN. If it determines that the user is satisfied with his choice of file name, it should return Gtk.FileChooserConfirmation.ACCEPT_FILENAME. On the other hand, if it determines that the stock confirmation dialog should be used, it should return Gtk.FileChooserConfirmation.CONFIRM. The following example illustrates this. This signal is emitted when the current folder in a Gtk.FileChooser changes. This can happen due to the user performing some action that changes folders, such as selecting a bookmark or visiting a folder on the file list. It can also happen as a result of calling a function to explicitly change the current folder in a file chooser. Normally you do not need to connect to this signal, unless you need to keep track of which folder a file chooser is showing. See also: Gtk.FileChooser.set_current_folder(), Gtk.FileChooser.get_current_folder(), Gtk.FileChooser.set_current_folder_uri(), Gtk.FileChooser.get_current_folder_uri(). This signal is emitted when the user “activates” a file in the file chooser. This can happen by double-clicking on a file in the file list, or by pressing Enter. Normally you do not need to connect to this signal. It is used internally by Gtk.FileChooserDialog to know when to activate the default button in the dialog. See also: Gtk.FileChooser.get_filename(), Gtk.FileChooser.get_filenames(), Gtk.FileChooser.get_uri(), Gtk.FileChooser.get_uris(). This signal is emitted when there is a change in the set of selected files in a Gtk.FileChooser. This can happen when the user modifies the selection with the mouse or the keyboard, or when explicitly calling functions to change the selection. Normally you do not need to connect to this signal, as it is easier to wait for the file chooser to finish running, and then to get the list of selected files using the functions mentioned below. See also: Gtk.FileChooser.select_filename(), Gtk.FileChooser.unselect_filename(), Gtk.FileChooser.get_filename(), Gtk.FileChooser.get_filenames(), Gtk.FileChooser.select_uri(), Gtk.FileChooser.unselect_uri(), Gtk.FileChooser.get_uri(), Gtk.FileChooser.get_uris(). This signal is emitted when the preview in a file chooser should be regenerated. For example, this can happen when the currently selected file changes. You should use this signal if you want your file chooser to have a preview widget. Once you have installed a preview widget with Gtk.FileChooser.set_preview_widget(), you should update it when this signal is emitted. You can use the functions Gtk.FileChooser.get_preview_filename() or Gtk.FileChooser.get_preview_uri() to get the name of the file to preview. Your widget may not be able to preview all kinds of files; your callback must call Gtk.FileChooser.set_preview_widget_active() to inform the file chooser about whether the preview was generated successfully or not. Please see the example code in Using a Preview Widget. See also: Gtk.FileChooser.set_preview_widget(), Gtk.FileChooser.set_preview_widget_active(), Gtk.FileChooser.set_use_preview_label(), Gtk.FileChooser.get_preview_filename(), Gtk.FileChooser.get_preview_uri(). Whether a file chooser not in Gtk.FileChooserAction.OPEN mode will offer the user to create new folders. Whether a file chooser in Gtk.FileChooserAction.SAVE mode will present an overwrite confirmation dialog if the user selects a file name that already exists. Application supplied widget for extra options. Application supplied widget for custom previews. Whether the application supplied widget for custom previews should be shown. Whether to display a stock label with the name of the previewed file.